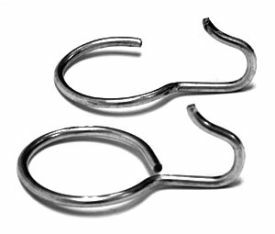 These individual hooks are an excellent alternative to CalHOOKS. They hold the heaviest cord-type books securely on your rods. May be used" rods. Order either the closed version (removed from a rod at the ends), or the open version (may be removed anywhere along the length of the rod). These are packaged 100 per package, Priced per package.